From scintillating white granites to brilliant serpentines - reds, greens, maroons, grays, yellows, and vibrant oranges - the stone of Zimbabwe is a visual catalog of incredible mineral wealth. More than 250 specific ores and combinations of serpentine have been identified in Zimbabwe. It is the complex combination of these minerals that create the colorful palette so unique to Zimbabwean carving stone. Artists use the locally found stone in Zimbabwe with the most common being Serpentine. Other stones include Verdite, Red Sandstone and Soapstone etc. Depending on the color, striations and contours of the stone, the artist during sculpting develops a relationship with the stone and depending on the form, carves a sculpture without sketches or drawings. Quintessentially, the stone dictates to the artist the subject that will emerge from within its core. The tools used are simply a hammer, chisel, file, water and sandpaper. Once the sculpture has been carved it is placed in a fire where the stone is heated. The final finishing stage is to apply a clear wax polish, which melts and absorbs into the stone, bringing out the stone's rich deep luster and color. Tsveru made a video of the mine in Tengenenge and the artists at work making their sculture. Plse remember is was the first time he had a video camera in his hands. Steady Gomo proudly presenting Sisters carved in opal. Opal stone is famous for it's milky colored greens and smooth texture. It is also unique in that it has fewer color variations than Serpentine. It is also known as Opalite to the locals and is mined at Chiweshe, two hours north of Harare. This stone is one of the favorites of carvers, as it's not as hard as Springstone, but still polishes to a high finish. Opal stone also has, at times, a brown color throughout the predominate green. The appearance can be smooth or mottled. As with most of the stones mined for the purpose of sculpting, opalite is mined without the use of power tools. Lemon Opal stone is easily identified by contrasting yellow striations within the stone. On the Mohs hardness scale, Opal stone rates between 5.0-5.5. Backwell Dirau presenting Wedding Flower carved in Fruit serpentine. Serpentine is the next hardest stone with a rating of 4.0-5.0 on Mohs hardness scale. Black Iron Serpentine derives it's name from the deposits of iron found in it and is one of the hardest and darkest stones found in Zimbabwe. It has the most amazing black lustrous finish that resembles the black opal and is highly sought after because of its fine finish, durability and hardness. Springstone is one of the hardest stones used for sculpturing in Zimbabwe. There are a few mines, where this stone is found, but Guruve, in the north, is where spring stone is mined. A beautiful dark stone, it polishes to a high shine because of its density. A feature of this stone, is often, it will have a softer brown layer, which adds to the appeal. As with most other stones that are mined for the purpose of sculpturing, this stone is mined by hand on communal lands. Verdite has a unique Emerald looking quality with brown and green striations and is known as "Green Gold" because it is a semi-precious stone, which is unfortunately becoming rare and therefore increasingly more valuable. It is a hard stone and only the more experienced sculptor will dare to sculpt it. 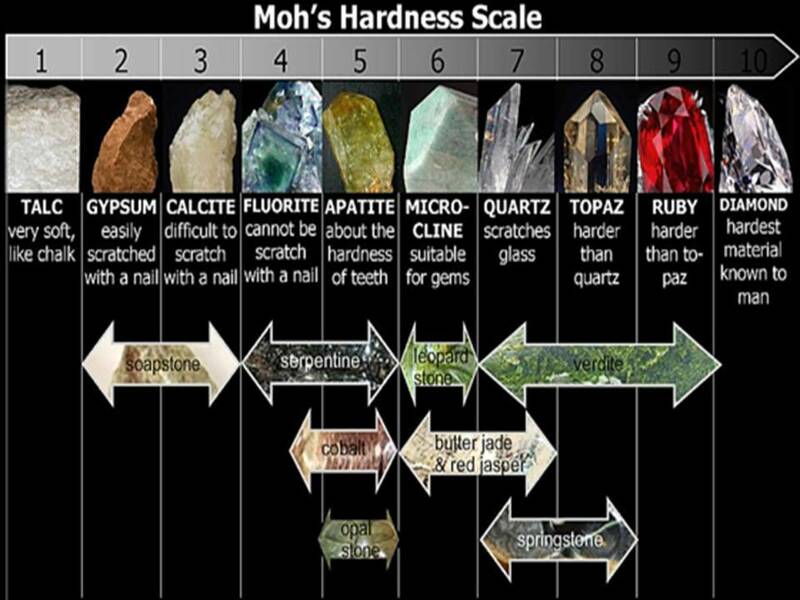 On the Mohs hardness scale Verdite rates between 8.0-9.0.